Some nitrogen-fixing microorganisms contain an enzyme for the simultaneous production of ammonia and methane. A new methane-generating pathway was discovered in Rhodopseudomonas palustris, but also occurs in some other nitrogen-fixing microorganisms. Nitrogen-fixing bacteria are the chief means by which nitrogen gas in the air is changed into a form that plants and animals can use. Roughly 10 percent of these nitrogen-fixing microorganisms contain the genetic code for manufacturing a back-up enzyme, called iron iron-only nitrogenase, to do their job. Recent research reveals that this enzyme allows these microorganisms to convert nitrogen gas to ammonia and carbon dioxide into methane at the same time. The ammonia is the main product; the methane is only a sideline. This enzymatic pathway is a previously unknown route for the natural biological production of methane. The findings are reported Jan. 15 in Nature Microbiology. The senior author is Caroline Harwood, the Gerald and Lyn Grinstein Endowed Professor of Microbiology at the University of Washington School of Medicine. The lead author is Yanning Zheng, a postdoctoral student in her lab. Read the paper and watch an animation by the researchers explaining their findings. "Methane is potent greenhouse gas. That is why it is important to account for all of its sources," Harwood said. In addition to being released from fossil fuels, methane also comes from microbial activity. In a single year, microorganisms, including many living in the ocean and decaying swamps, form and consume at least a billion tons of methane. The archaea, single-cell life forms that tend to like harsh environments, are the main methane generators. To accomplish this, they avail themselves of complex chemical pathways, some of which already have been traced by scientists. Besides its ecological significance, a better understanding of the various ways microorganisms manufacture methane is medically important. Methane production can play a role in the interactions in microbial communities that inhabit humans and animals. Methane in the gut, for example, is suspected of contributing to some digestive disorders. However, although iron-only nitrogenase was identified several decades ago, scientists had not yet noticed that it, too, could be used by some microorganisms for methane production. "It's been a neglected enzyme," Zheng said. His team is studying an adaptable bacteria that can acquire its energy from a variety of reactions, Rhodopseudomonas palustris. 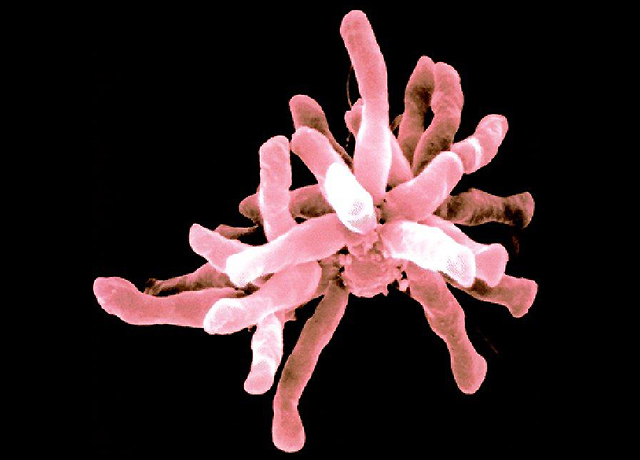 Still, the researchers did not expect that the methane they were seeking would be generated by iron-only nitrogenase in this organism. "There is now recent evidence that iron-only nitrogenase is active in microbes more often and in more conditions than we had previously thought," Zheng observed. To make sure this methane-generating pathway was not exclusive to Rhodopseudomonas palustris, they tested for similar abilities in three other nitrogen-fixing bacterial species that have iron-only nitrogenase. They also examined data that showed that genes for iron-only nitrogenase were detected in a number of physiologically diverse microorganisms that also vary in the conditions under which they survive. They learned, too, that the Rhodopseudomonas palustris ability to produce even a tiny amount of methane enabled a methane-utilizing bacteria to grow in the same lab culture. It is likely, according to the researchers, that interactions like these occur in nature and support the activities of methane-oxidizing bacteria. This form of methane production might, for example, help shape microbial community interactions in marine sediments, in the soil, and in microbiomes living in humans and animals.